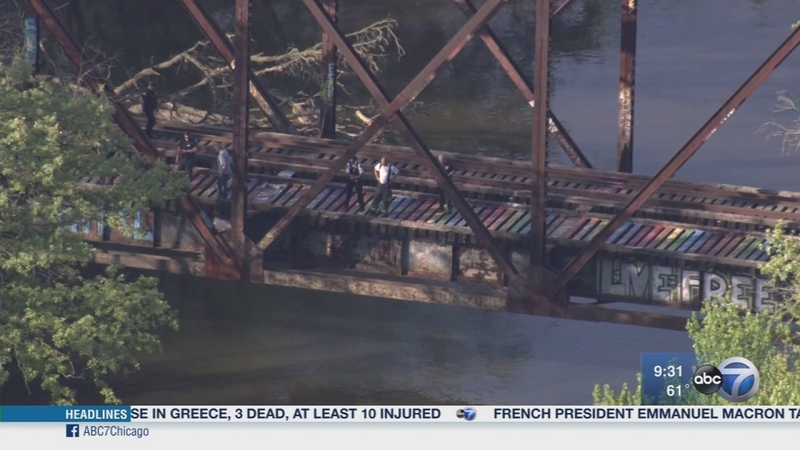 UNINCORPORATED COOK COUNTY, Ill. (WLS) -- Recovery teams and volunteers returned Tuesday morning to the Des Plaines River near Melrose Park to search for a teenager who went underwater over the weekend. Cameron Sanders, 16, of west suburban Villa Park, was last seen Saturday, when he and a group of friends jumped into the river from a railroad bridge in Thatcher Woods near Melrose Park. His family said he did not know how to swim and may have given into peer pressure. Cook County Sheriff Tom Dart confirmed there is cellphone video of the incident, but said it does not show any foul play or evidence that the teenager was taunted or bullied into jumping. "He was struggling in the video," Dart said. "The young boy who was already in with him tried to save him. The current is incredible and they were taking away. The other boy was trying to save him, he was starting to struggle and then shortly after another boy jumps in and he was having trouble." Relatives organized their own search party over the weekend, criticizing local crews for ending the search early on Sunday. Dart explained why divers had to leave the river. "They were getting taken away by currents. There was a lot of concern that there was going to be some serious injuries if that continued. So some of the traditional things with the diving no longer are real options," Dart said. "I just want everybody to know that we're not giving up. We're going to find him." Officials from the Cook County Sheriff's Department has taken the lead on the search. The search resumed around 8 a.m. near West Belmont Avenue and North River Road in nearby Franklin Park. The search will continue until the teen is found and all available resources will be used, including sonar boats, helicopters, search dogs and teams on foot, the sheriff's office said. On Tuesday, Rob Larson, a K9 search and rescue worker who four years ago found the body of a missing one-year-old boy, used his own boat and resources to search for the teen Tuesday afternoon. Authorities said the bridge, known as the "Rainbow Bridge," is extremely hazardous. It is unmarked and has no fencing. Dart demanded the bridge's owner, Canadian National Railway, install fencing and signs to "prevent another tragedy." His family wants the bridge torn down. The bridge, located behind the Lincoln College of Technology, has been considered a dangerous hangout for kids for years. "We used to go fishing there and the engineers used to wave to us, but this is turning into a tragedy," local resident Scott Manno said. Anyone interested in helping with the search should call 847-635-1188.